This week on IndyCar Flashback, we begin profiling some historic Indianapolis 500-mile races. Our first is the 1971 Indianapolis 500, a race that saw several historic moments, both on and off the track. Despite the dominance of the previous year in USAC by Al Unser, the reigning 500 winner’s Vel’s Parnelli Jones Racing Colt-Ford would not head into 1971 as the car most were talking about . That distinction would instead go to the McLaren M16. Equipped with a controversial rear wing affixed to the engine cover, the car was put under heavy inspection by USAC . After arguing that it was part of the rear wing design, McLaren won their appeal to USAC and went on to dominate Pole Day. Peter Revson grabbed the track record with a track record speed of 178.696 MPH, more than 1.5 MPH ahead of Mark Donohue. McLaren would be the chassis of choice for three of the top four qualifiers, with Unser slotted in fifth. As the 33-car field took the green flag, trouble broke out on pit lane. The Dodge Challenger pace car being driven by local car dealer Eldon Palmer veered into a photographers stand. 29 people were injured, but the race continued on. Meanwhile, Donouhe powered past Revson to take the early lead. The Penske Racing driver would showcase the power of the McLaren early on, leading the first 50 laps. Following two short yellows in the first 10 laps, the first major incident of the day occurred on Lap 12. Steve Krisiloff’s car blew an engine in Turn 3, and Mel Kenyon slid in the oil from the incident, prompting the yellow caution lights to be displayed. Gordon Johncock and Mario Andretti were racing and did not see the yellow lights either. The two then slid in the oil as well, with Johncock sliding over the top of Kenyon’s car. All drivers walked away, with a cut to Kenyon’s shin being the only injury from the crash. 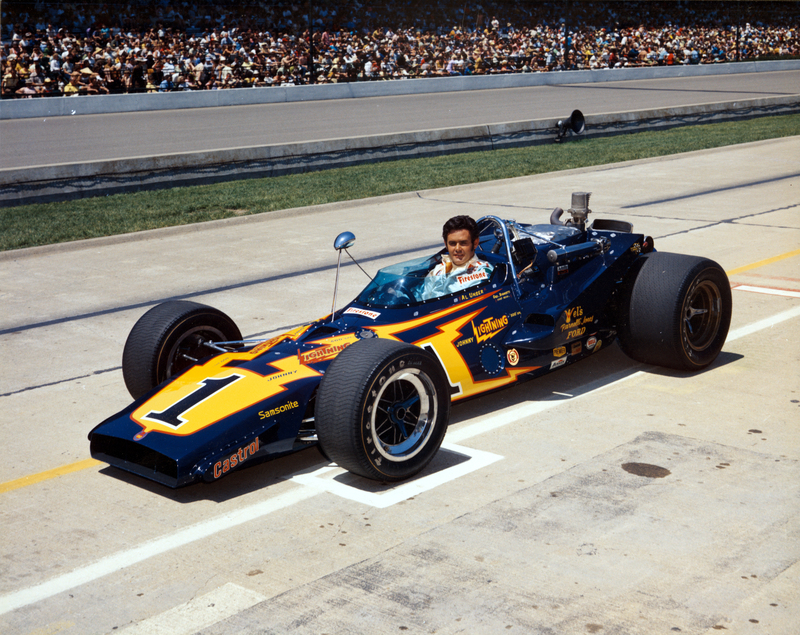 Peter Revson would earn his best finish at Indianapolis in 1971 after starting on pole. After a lengthy cleanup, racing would resume, With the exception of pit stops, Donohue continued to dominate, until a gearbox issue knocked him out of the lead and the race on Lap 66. Unser and 1968 pole sitter Joe Leonard swapped the lead five times over the next 32 laps. After Lloyd Ruby led for three laps mid-race, Unser’s brother and 1968 race winner Bobby made his way to the front. The elder of the two Unser brothers led nine laps before relinquishing the lead back to Al. From there, Al would lead 88 of the final 90 laps. There was still more carnage to unfold in the race, unfortunately. On Lap 113, David Hobbs lost an engine on the front stretch and Rick Muller spun in the oil and crashed into Hobbs in the process, sending the rookie head-on into the wall. Fortunately neither driver was hurt. On Lap 167, Mike Mosley smacked the outside wall in Turn 4, then crashed in the infield wall and the abandoned cars of Donohue and Krisiloff, resulting in a massive fire. Gary Bettenhausen stopped to help pull Mosley from the wreckage as the fire was being put out. Mosley survived the crash, but suffered a broken leg. During the crash, Bobby Unser and Billy Vukovich II spun to avoid the crash. Vukovich continue on, but Unser hit the outside wall and his bid for a second win in four years ended. Following the restart on Lap 185, Unser continued to pull away. He would go on to win the race by 22.88 seconds over Peter Revson. Despite the yellows, the race was run at a record average speed of 157.735 MPH. Unser became the third repeat winner and the first since Bill Vukovich did so in 1953 and 54. The 1971 500 became historic for several historic achievements both on and off the track. Here’s a look at some of the big milestones from that race. Unser would finish second t in 1972, falling one spot short of an unprecedented 500 three-peat. In 1978, Unser earned his third 500 win en route to a Triple Crown with wins at the 500-mile races in Ontario and Pocono, the only driver to accomplish this feat. His last win at Indianapolis would come in 1987, joining A.J. Foyt as the second four-time 500 winner. Despite not leading a lap, the pole winner finished second. He would start second and tenth the following two years at Indianapolis, but finished 31st both times. The next year, he moved on to Formula 1. Tragically, Revson’s life was cut short after a crash in South Africa during the 1974 season. Donohue would earn redemption the following year, winning. the 500 at a record speed of 162.962 MPH, which would not be broken until 1984. Donohue retired in 1974, but came back to drive for Roger Penske’s Formula 1 team the next year. He was killed during that season from injuries after a crash in Austria. The 1971 500 represented a major shift in television coverage of the 500. The previous six races were shown only via a highlights package on ABC’s Wide World of Sports the following week. 1971 marked the first time ABC would broadcast the race on a same-day tape delay. The network would continue this tradition through 1985, before broadcasting the race live and flag-to-flag in 1986. This year will mark the end of ABC’s 54-year run as broadcast partner for the race before NBC gains broadcasting rights next year. Great read, thank you for the article.